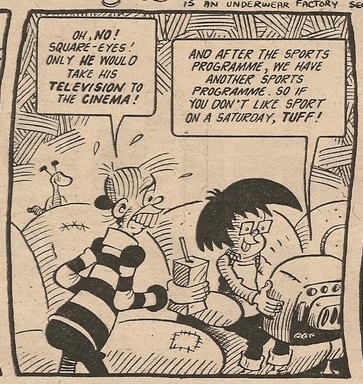 The cinema-based shenanigans of Interval occupied page 29 in Cheeky Weekly's first issue, but the following week the main feature of the Saturday morning picture show, the sci-fi thriller Space Family Robinson, began a 9 week run in the subject location, at the end of which Interval moved back in, that particular issue being the 1977 Christmas edition. After the festivities, the Robinsons resumed occupation of page 29 for a marathon 25 week run, which brought them to the conclusion of their story and saw them (spoiler alert) return to Earth after a hazardous sojourn on an distant planet. The space family appeared on page 29 a total of 34 times, making them the most regular visitors to that location. 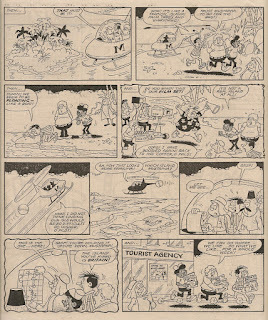 Interval then enjoyed a 2 week page 29 run, after which the big-screen adventures of James Bold on The Island of Fear moved in as from the serial's 3rd episode and ran to the conclusion of that particular adventure, which also brought to an end Bold's Cheeky Weekly appearances, 3 weeks later. 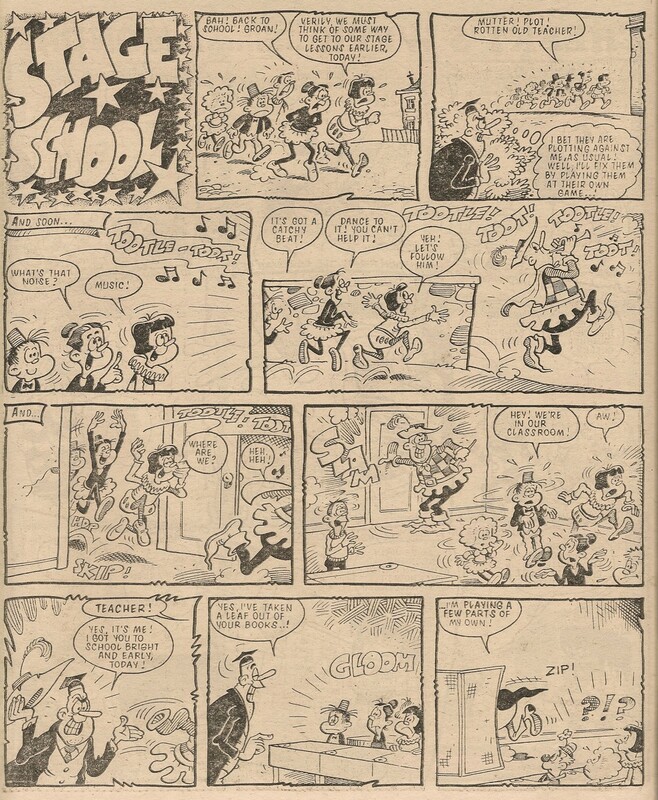 Taking over from Bold as the adventure serial element of Cheeky's cinema visits as of the 12 August 1978 comic was Archie's Angels, a tale of fearless flying reprinted from Whizzer and Chips. 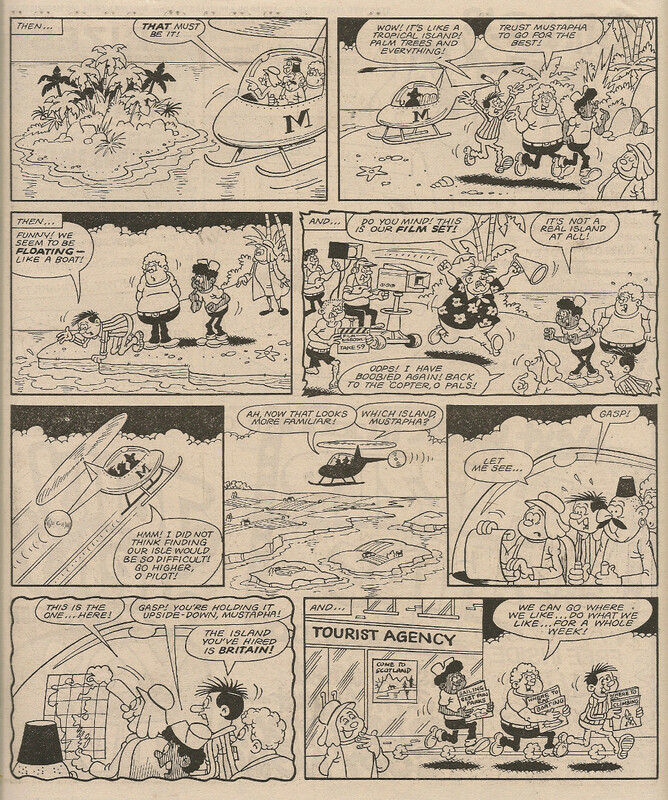 Page 29 hosted the entire 6-week Angels adventure (or at least page 2 of their debut 3-page instalment, and page 1 of each of the subsequent 2-pagers). Following the Angels as the thrill-providing segment of the cinema show, and occupying page 29 a week later, was another reprint, this time resurrected from the pages of Cor! 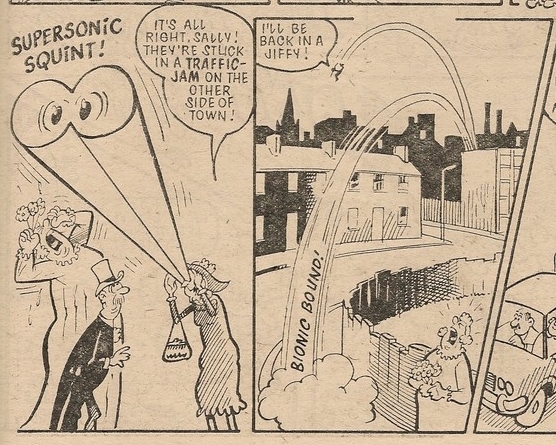 !, the punningly-named Sonny Storm who appeared in only one issue of the toothy funster's title. 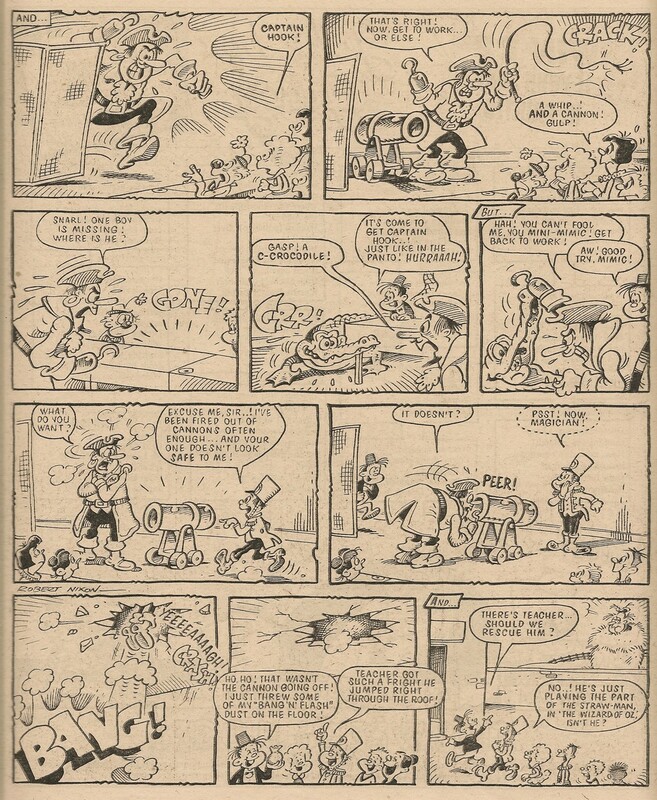 Interval then returned to page 29 for what was to be a 9-issue run that concluded its appearances in the location under review and making it the third most regular occupant of page 29 with a total of 13 visits. 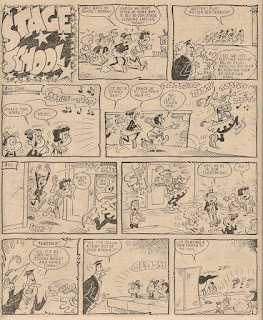 In the 2 subsequent issues, dated 02 and 09 December 1978, there was no page 29, as industrial action led to the page count being reduced from the usual 32 to 28. 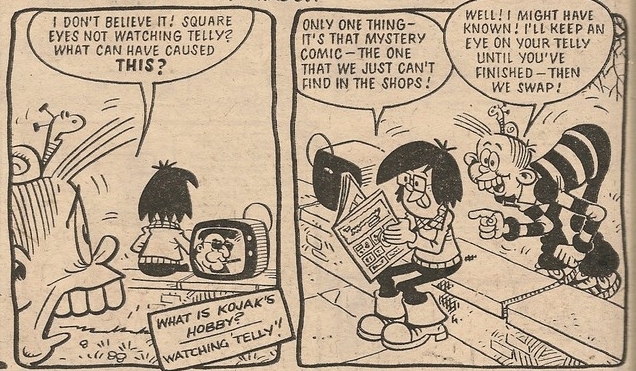 The industrial troubles then evidently worsened, as Cheeky Weekly failed to appear for 3 weeks. 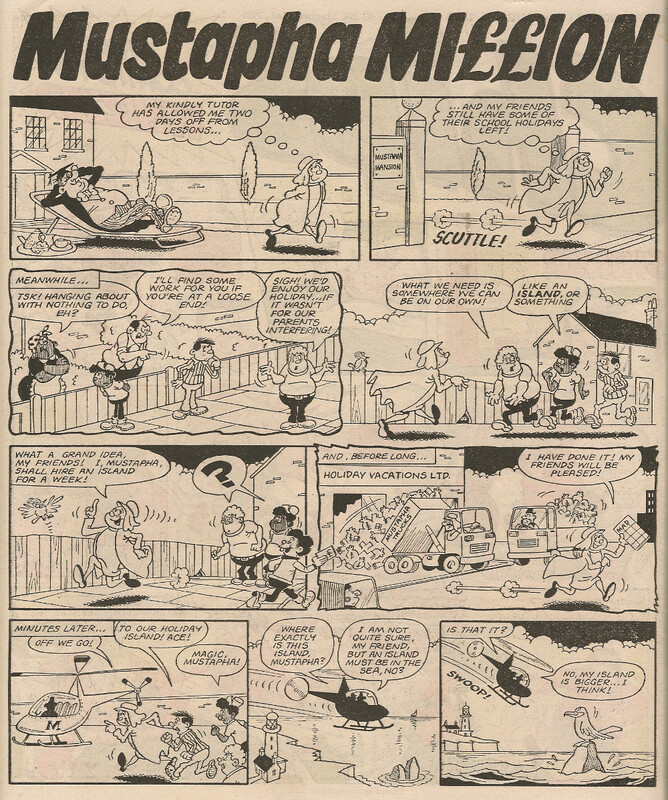 It seems the dispute was resolved by mid-to-late December, as publication resumed with the issue dated 06 January 1979, in which The Burpo Special came to rest on page 29, initiating a run in that location which would last for 7 weeks. 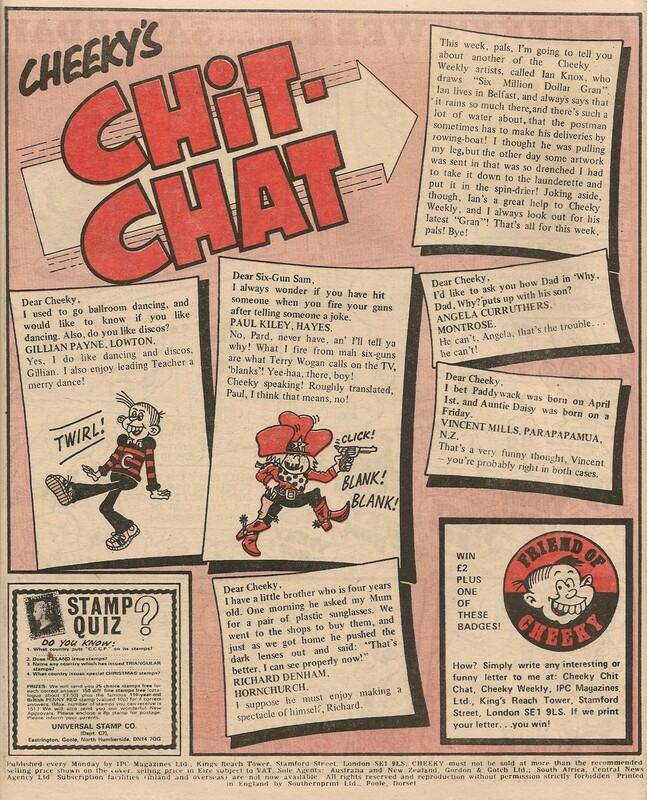 Cheeky Weekly's letters page, Chit-Chat, then took over page 29 for 2 weeks, being ousted in the 10 March 1979 edition by a returning Burpo Special, that week focusing on Krazy Town's risible rozzer, Constable Chuckle. A week later however, Burpo was again displaced, this time by a rather scrappily- constructed page consisting of the answers to the Disaster Des spot-the-difference puzzle that appeared on page 14, 2 stamp collecting ads (“please tell your parents”), an ad for IPC's Mickey Mouse comic which was running a competition to win a holiday at Walt Disney World in Florida, plus a reminder to readers that successful contributors to the Chit-Chat feature would bag £2 and a Friend of Cheeky badge. In the following issue the subject location listed the 50 the lucky winners of a Smurfs LP from the competition which had appeared in the 09 December 1978 comic, and below that list of kids who would soon be tormenting their parents with the warblings of the shrill-voiced blue elves, was an ad alerting readers to the presence of a knitting pattern for Cheeky's jersey in the following edition. Chit-Chat came to rest on page 29 in that special jersey issue, but in the 07 April 1979 comic it was Cheeky's Saturday doings that were related there. 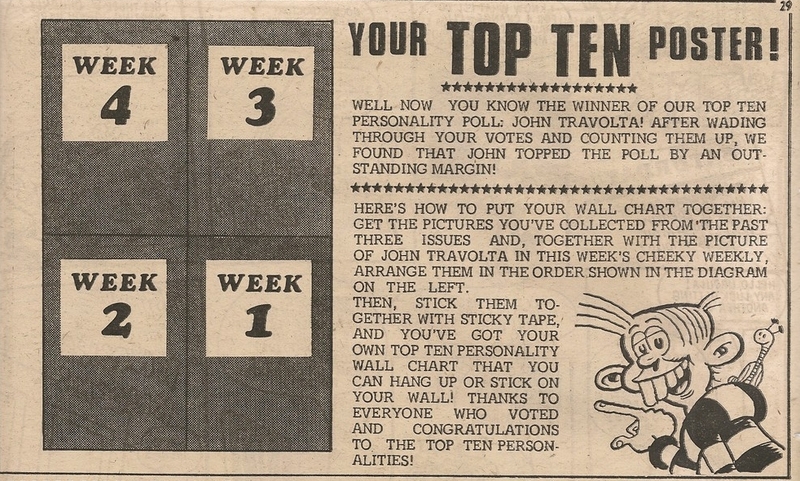 7 days later the subject location contained instructions for assembling the Top Ten poster, the second part of which was included in that issue, plus an ad for that year's Cor!! 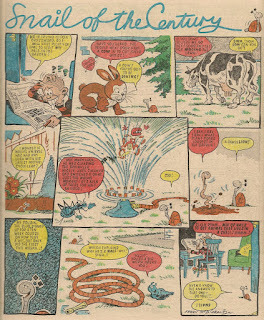 Holiday Special (despite the weekly title having ceased publication in 1974). 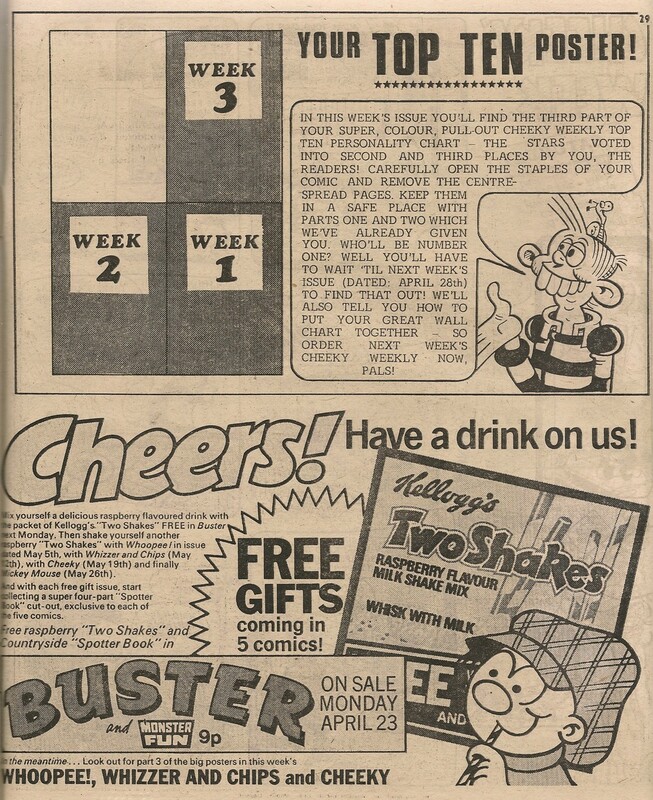 The poster instructions were repeated on page 29 in the next issue, but sharing the page this time was an ad announcing that packets of Kellogg's milkshake mix were to be given free with upcoming editions of Buster, Whoopee!, Whizzer and Chips, Cheeky Weekly and Mickey Mouse. Cheeky guided readers through the complexities of assembling the Top Ten poster yet again a week later, which was the issue containing the final section of the (less-than-scintillating) wall adornment. 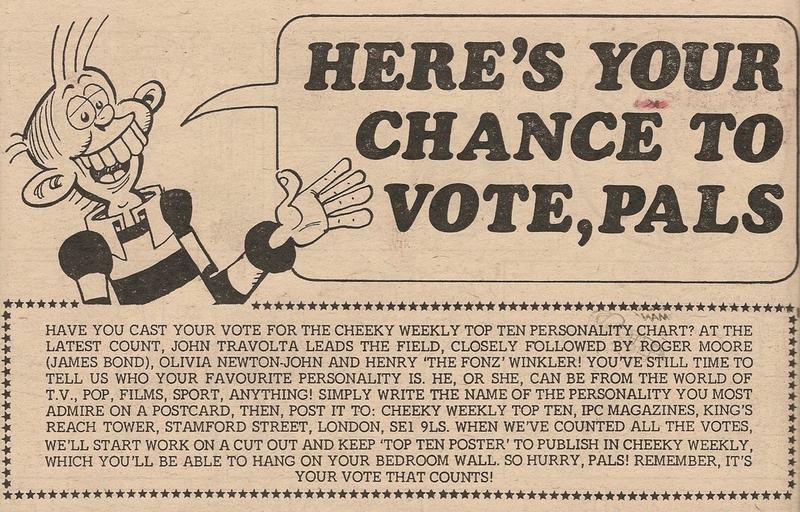 Below the instructions were 2 stamp collecting ads, a reminder that cash was to be won by contributing to the Joke-Box Jury, Paddywack and Chit-Chat pages, a coupon enabling readers to order their Cheeky Weekly from the newsagent and, to fill an empty space, a drawing of Snail with associated thought balloon, placed in such a way that he was depicted as thinking, in his own molluscy fashion, the 'cash prizes' reminder. 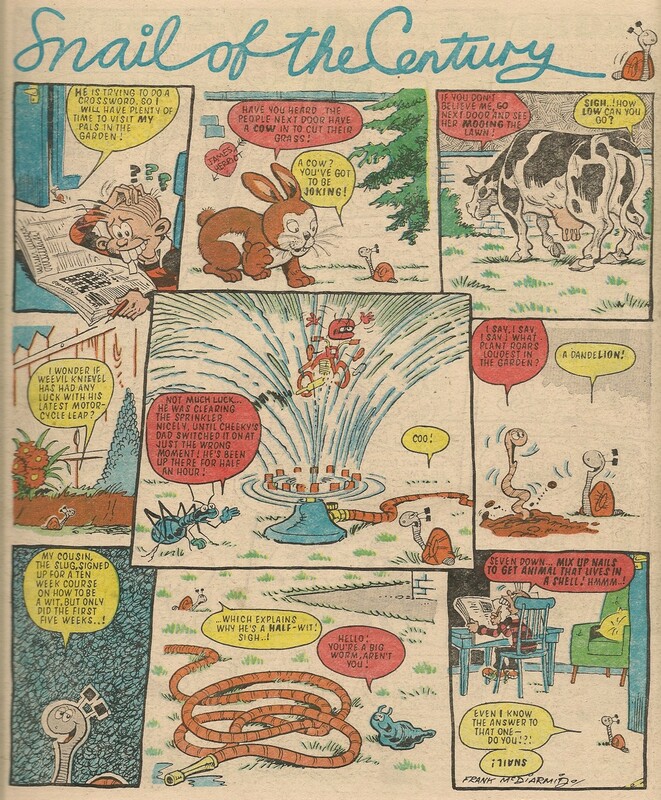 In the 05 May 1979 comic, with the holiday season looming, page 29 was the site of ads for 2 more IPC Specials – that year's Krazy (another posthumous special, Krazy - the title which spawned our toothy pal - having bit the dust a year earlier) and Frankie Stein summer collections. 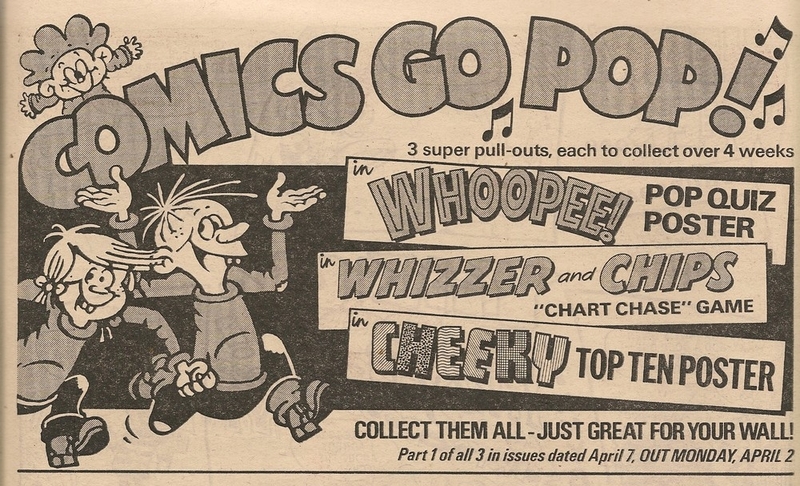 Chit-Chat then returned for 2 weeks, being usurped by Joke-Box Jury, after which page 29 was again given over to ads for IPC product, this time promoting the company's newest humour title Jackpot and long-running educational mag Look and Learn. 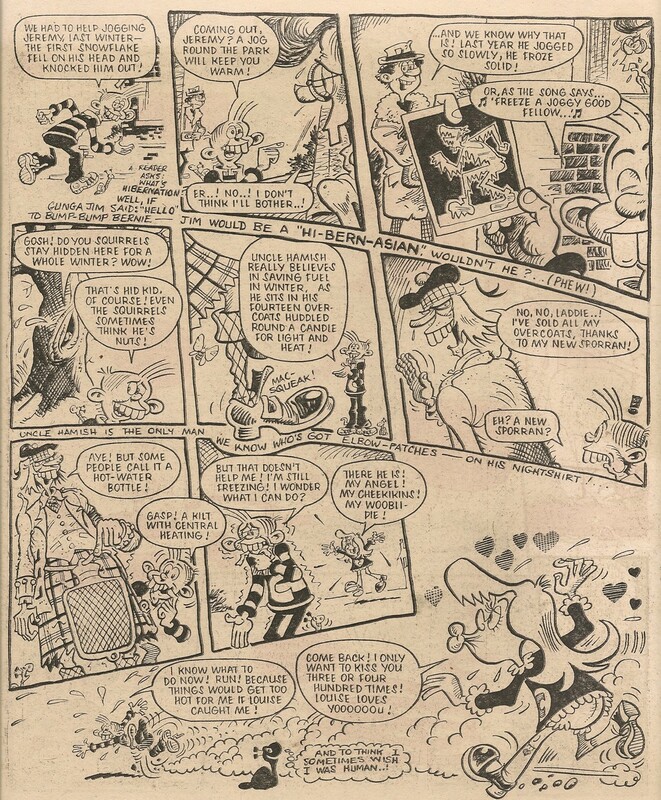 More IPC ads were to follow in the next issue when the Buster Holiday Special was allocated a half-page slot prominently featuring that comic's humorous take on Jaws, Gums, below which Cheeky turned up to announce the following week's special Disco issue of Cheeky Weekly, and helpfully providing another coupon with which to order the comic from your local newsagent. The lively letters of Chit-Chat then enjoyed another 2 week page 29 outing (on the second occasion sharing the page with an ad for IPC's piscatorial publication Angler's Mail), after which an ad for model aircraft from the North Pacific Flyers range shared the page with yet another announcement by Cheeky, this time informing readers that as of next week, the Mystery Comic was to be incorporated into Cheeky Weekly, ending its run as a comic-within-a-comic (although all the Mystery Comic features would continue). 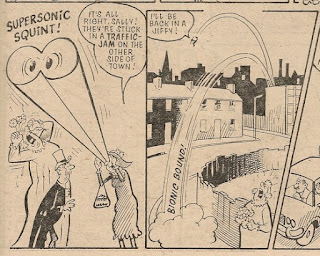 Our grinning pal was so excited by this development, together with the news that two new stories would join his comic, that on this occasion he forgot to provide a newsagent's coupon. Erstwhile Mystery Comic cover star, the rotund rascal Tub, finding himself freed from the constraints of the centre pages of the comic, then made his sole visit to the subject location, sharing the site with an ad for Dunlop's Playsport line of outdoor game equipment. 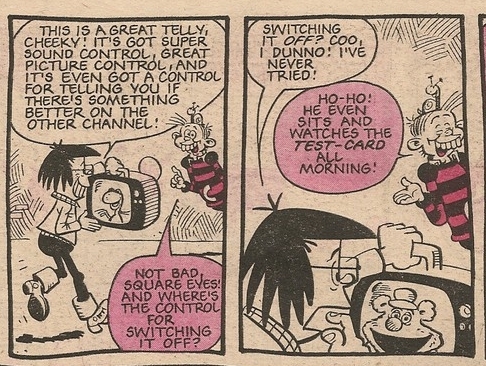 It was then the turn of Stage School to make a single appearance on page 29, after which another pair of IPC ads turned up, this time the first Jackpot Summer Special was promoted alongside Walt Disney's Puzzle Time. 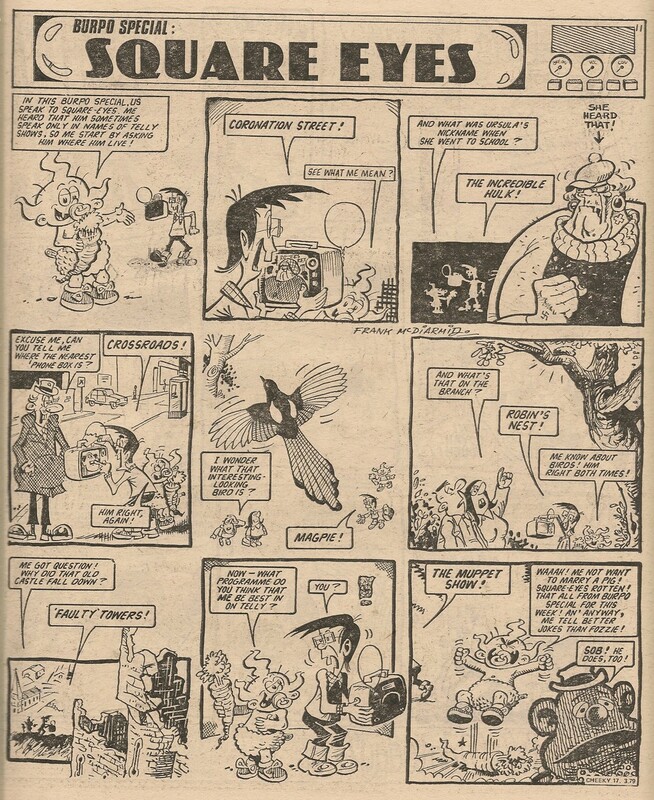 Paddywack made his debut page 29 appearance a week later, and the 2 subsequent editions carried in the subject location the same ad for retailer WH Smith, who were offering free posters (although little detail was given about the content) with purchases of Corgi, Dinky and Matchbox toys. 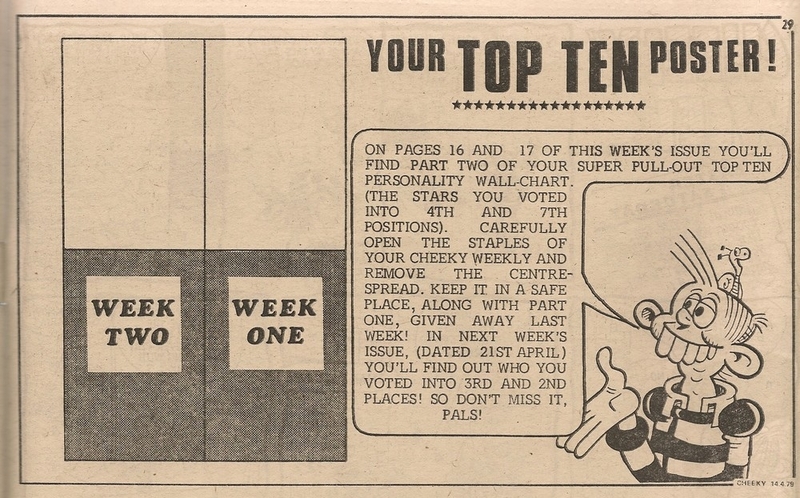 The following week an ad for the first merged issue of 2000AD and Tornado shared the location under review with an ad for Freshen-Up chewing gum and more poster assemblage instructions, this time relating to the Giant Cheeky Poster, the first part of which, featuring our toothy pal's feet, was included that week. 7 days later another ad appeared, this time placed by confectioners Trebor, who were running a promotion whereby consumers of their Double Agents boiled sweets could obtain a Double Glow Seven kit, consisting of an iron-on transfer and sheet of stickers, both of which would glow in the dark (“tee shirt not included in offer”). 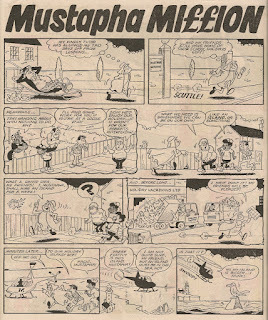 In the 01 September 1979 comic, page 29 was the location of another ad for IPC's Walt Disney's Puzzle Time, together with an ad for Whizz-Kids – nothing to do with IPC's Chips-encapsulating title, but rather a line of instructional paperback books published by MacDonald Educational on topics such as ponies, bikes and birdwatching (not to be carried out simultaneously, I hasten to add). Mustapha Million then brought his brand of affluent adventures to the subject location for a single time, and a week later the whole page was given over to an ad publicising the debut issue of IPC's new footie mag, Top Soccer, which included a free autograph album (blank, presumably). 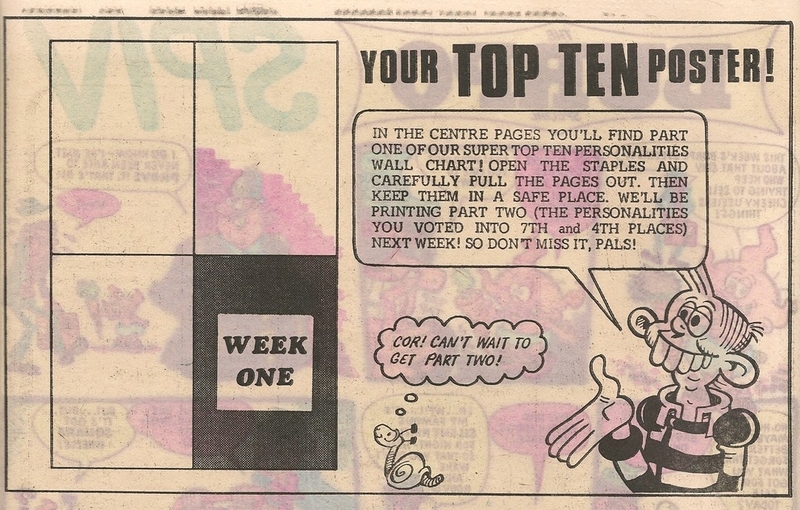 Top Soccer was advertised again on page 29 in the following issue, but this time the ad was reduced to a half page which shared the site with a promotional boost for the 1980 Cheeky Annual, the first time that year's hardback collection of Cheekiness had been advertised in Cheeky Weekly. The perplexing prattlings of Paddywack then returned to the subject location for one week, after which our mayhem-generating mate Disaster Des moved in for his single, catastrophic visit. Paddywack then returned, but a week later was deposed by the gagsters of Joke-Box Jury. Paddywack then fetched up for a 3 week run that was to conclude his visits to page 29. 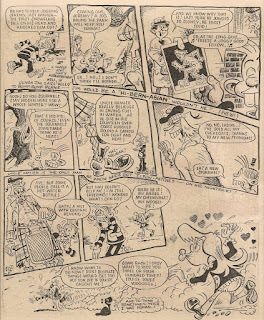 Chit-Chat then moved in for the 12 weeks that remained before the toothy funster's comic was cancelled, bringing the number of times that this reader participation feature appeared in the subject location to 19, making it the second most regular occupant. 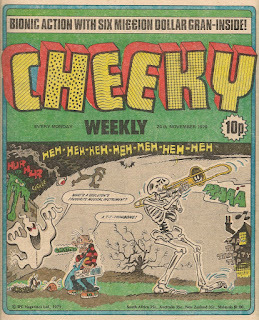 Bruce is presenting a series of posts marking the fortieth (yes, it really is forty years) anniversary of the first issue of Cheeky Weekly. It's a good thing he's doing it because I'm not organised enough to have planned any celebrations - maybe I'll do something for the fiftieth (makes note in diary). 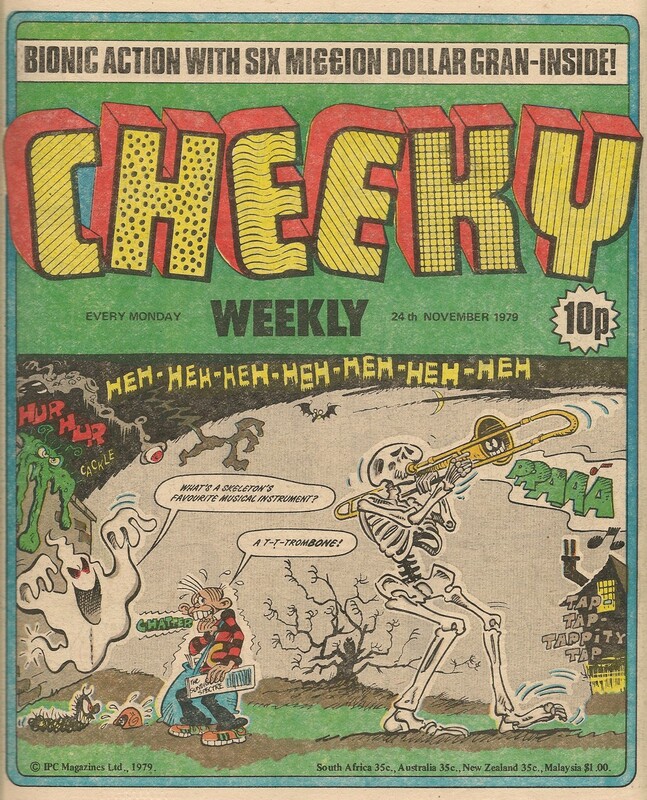 In a cover that's reminiscent of Cheeky's erstwhile Sunday paper deliveries to the creepy house (the last of which featured in the 12 August 1978 edition) our toothy pal engages in a ghostly gag with Spook on this week's cover. 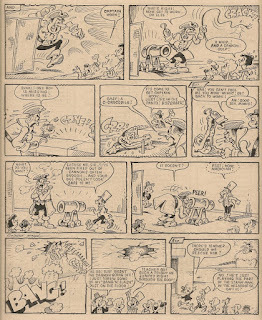 Cheeky hasn't been this scared since he read his final Creepy Sleepy Tale way back in the 26 August 1978 issue. Frank McDiarmid delivers another cracking cover, the second time this month that he has furnished skeletal sketches, the previous occasion being the issue closest to Halloween. This week's eerily atmospheric front page image would maybe have been more suited to that earlier slot. The above-title banner is another instance of the reference to '6 Mi££ion Dollar Gran' which, as I discussed here, isn't appropriate for a variety of reasons. Neither is she bionic but I've groused about that so many times that I'm not going to mention it. 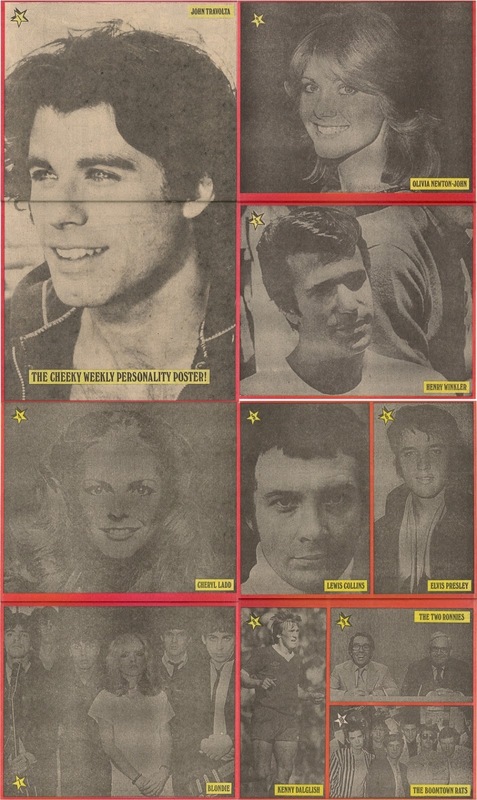 This week's Cut-Out Comedy Catalogue consists of a selection of gags pertaining to drain-dwelling wit Manhole Man. There are further misrepresentations of Gran's attributes in her story, this week concerning a missing bridegroom, where she is described as performing a 'supersonic squint' (eh?) and a 'bionic bound'. 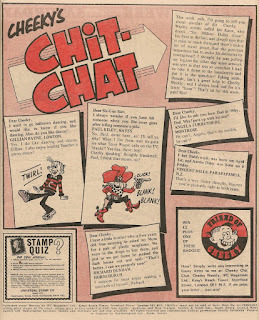 On the Chit-Chat page, Cheeky's column continues to furnish us with background info on the creative team behind his comic. 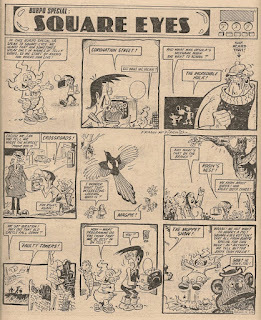 This week it's Ian Knox who comes under scrutiny. 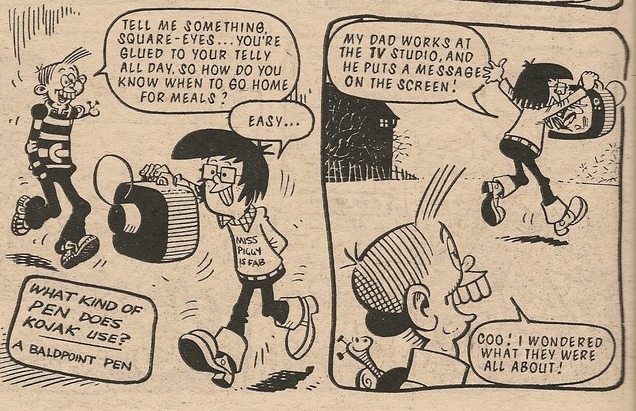 Previous Chit-Chat columns have omitted artists' surnames so Ian is honoured to get a full namecheck. The image of Cheeky below Gillian Payne's letter is a redrawn (by whom? 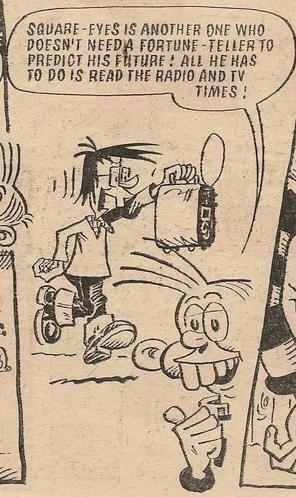 - an art assistant probably) version of one of Jimmy Hansen's Cheeky Hustle illustrations from the 16 June 1979 Disco Special. Cheeky's feeling chilly on Saturday so lines up some low-temperature laughs. The toothy funster's back in the warm by the commencement of Snail of The Century, wherein his mollusc mate, having concluded his customary slimy tour of the back garden, resolves the crossword dilemma, thus rounding off another issue. 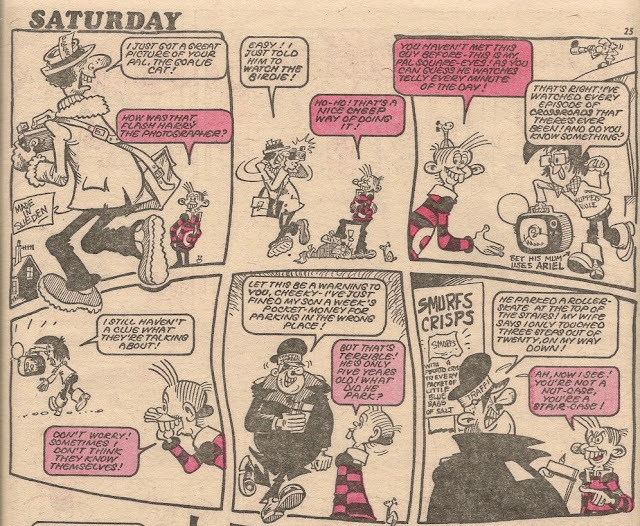 This week's comic contains an all-Frank McDiarmid Cheeky's week, as did the previous issue.